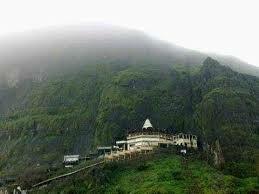 Here is Some Information about Saptshrungi Devi Temple in Vani Maharashtra Iindia. The Saptshrungi Devi Temple is located near Nashik city is situated at a distance of 60 km from Nashik.It is one of the most visited and religious places for pilgrims.As the temple is situated on a mountain, a regular bus service is provided from the foot of the mountain to the temple. Shree Saptshrungi temple is one among the 51 shaktippethas temple in India and one of the four shaktippetha temple in Maharashtra, other being,Mahalakshmi temple Kolhapur,Tuljapur Bhavani Temple, Mahur Gad Devi temple in Mahur. Devi is huge-about 10 feet tall with 18 hands, holding various weapons. 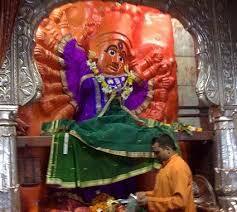 The idol is always coated with Sindoor, which is considered auspicious in this region. She is also known as Mahishasur Mardini, the slayer of the demon Mahishasur, who took the form of a buffalo. At the foot of the hill, from where one starts climbing the steps, there is the head of a buffalo, made in stone which is believed to be a demon. It is believed that the Devi Mahatmya, a sacred book which extols the greatness of Devi and her exploits was composed at this place by the sage Markandeya, who performed rigorous penance on a hill opposite the one on which the Devi resides, which is now named after him. The Devi Mahatmaya is to be read during the Chaitra and Navratri , it is hymn which includes a number of mantras and describes the battle which take place between Durga Devi and the asuras. You will notice that most of the hindu scriptures are written in such a way that it strikes a chord with the common people. It was done by dramatising the basic essence of the thought, which was required to be communicated. So also with this hymn, what it conveys is that by praying to the devi with devotion, she assists in quenching one’s malefic thought process. Thus uplifting oneself spiritually. 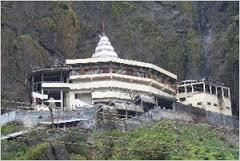 By Road : The temple is well connected with the city of Nashik with state transport buses. 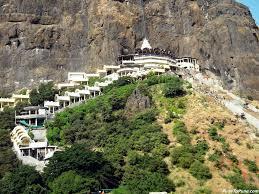 The closest and highly connected city from Saptashrungi evi temple is Nashik city.The closest and highly connected city from Saptashrungi devi temple in Nashik city. 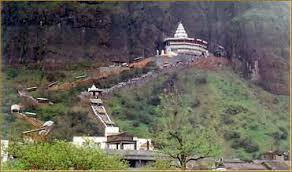 By Train : The Nearest Railway station is Nashik Junction (60 Km ). By Air : The Nearet Airport is Nashik ,Pune and Mumbai.